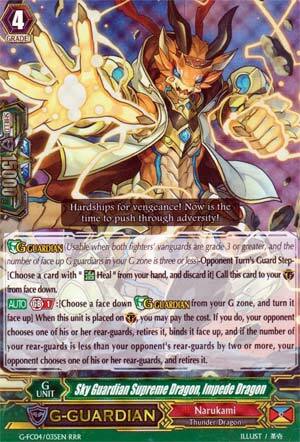 [G guardian] (Usable when both fighters' vanguards are grade 3 or greater, and the number of face up G guardians in your G zone is three or less)-Opponent Turn's Guard Step-[Choose a card with "Heal" from your hand, and discard it] Call this card to your (GC) from face down. [AUTO] Generation Break 1:[Choose a face down G guardian from your G zone, and turn it face up] When this unit is placed on (GC), you may pay the cost. If you do, your opponent chooses one of his or her rear-guards, retires it, binds it face up, if the number of rear-guards your opponent has is two or more than yours, your opponent chooses one of his or her rear-guards, and retires it. Here is Narukami's solution to unlock Thunderstrike if the opponent's some douchebag using Magia. On GB1, flip a G-Guardian to make the opponent retire and bind a rear-guard of their choosing, and then if the opponent still has 2 or more rear-guards than you, they have to retire (but not bind) another rear-guard of their choosing. This is admittedly no Denial Griffin since the opponent usually won't retire the attacker unless they have everything else yet to attack, but that's not the point. What's he's meant to be here for is to not only get something, ANYTHING, in the bind zone so Thunderstrike isn't dead, but also to buff Dragonic Vanquisher by another 6k power potentially during your opponent's turn, so it can shrug off more attacks. The conditions to retire 2 are pretty tricky unless the opponent is a habitual field ruin-er like Link Joker or a fellow retire-based player, or if you spammed Vanquisher's personal Crit pretty cleverly, but the potential is there. New staple for any Narukami deck.